NJERHS owns the following eight trolley cars from New Jersey. Additionally, four Pennsylvania Railroad MP-54s and two Lackawanna MU cars owned by the United Railroad Historical Society of NJ are having their preservation overseen by NJERHS. Scroll down for more information! Public Service Railway Company built this car at their Newark (Plank Road) Shops in July 1917. It was part on a second group of fifty compromise roofs cars built by PSR between June 1917 and Aug 1917. The car measuring 50 foot 10 inch over its bumpers was outfitted on August 11, 1917 with new Standard 0-50 trucks carrying four 514C motors. Initially, the double-ended car received two HLD controllers and a CP27 Compressor. It was equipped with independent air brakes and HB Life-Guard Fenders. The 36 foot 6 inch car body had a seating capacity of 50 on longitudinal seats. In 1917, the car used a Pay on Platform fare system. Folding doors steps were noted on the car record as original equipment. The Public Service Railway car service record indicates 2651's first assignment to Roseville Car House, Newark on September 9, 1917. Assignment to Roseville continued exclusively with short transfers to the Newark Shops until August 1921. July 18, 1919: Trucks motors and compressor removed to 2686. August 20, 1919: 050 trucks with 4-514 motors and CP27 compressor received from 4155. September 1, 1920: Trucks and motors transferred to 1810. B27G with 101C motors (4) were received from 4109. From August 5, 1921 through December 1923, there were short assignments to various car houses: South Orange, Miller Street, Roseville and Lake Street. February 16, 1922: Trucks transferred to 1659 and motors to shop. B27G 1 ½ with 514 motors were received from 1659. February 16, 1922: Controllers changed to two K35. May 15, 1922: Trucks, motors and compressor removed to 1477. May 16, 1922: Trucks (2-050), motors (4-514) and CP27 compressor from 2681 installed. April 28, 1923: Trucks, motors and compressor to 4129. April 31, 1923: Trucks B27G1½ from 4105. September 29, 1923: Trucks (2-050) and motors (4-200J) from 4129 installed. December 11, 1923: started an assignment to Miller Street with only short assignments to other car houses that lasted until March 1930. February 9, 1927: One window wiper installed. June 13, 1929: Air gong installed. March 26, 1930 saw a series of bouncing assignments between Big Tree, Miller St, South Orange and the Newark Shops (presumable for maintenance) lasting until September 1935. November 15, 1932: Trucks and motors removed to 2718, trucks and motors from 4001 installed. September 17, 1935 saw assignment to Miller St until 1937 with some short transfers to Roseville and Newark Shops (presumably for maintenance). 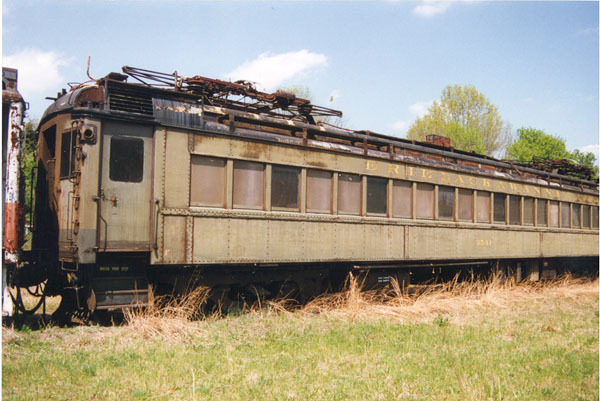 The car was reported stored on Passaic Wharf from October 1, 1937 to October 1, 1940. An entry in the car record shows an October 1, 1944 assignment to Greenville Car House. (Note: PSR routinely documented equipment locations on October 1st of each year. Car retired from active service. Car returned to service to assist in WWII shuttled workers to the Navy Ship Yards in Elizabeth, NJ. Sold and moved to Long Valley, NJ to provide a temporary home while a permanent home was constructed. Reports of a car body in Long Valley result in the location of the car and its purchase by Tony Hall. Car moved to Ringoes, NJ for restoration work. 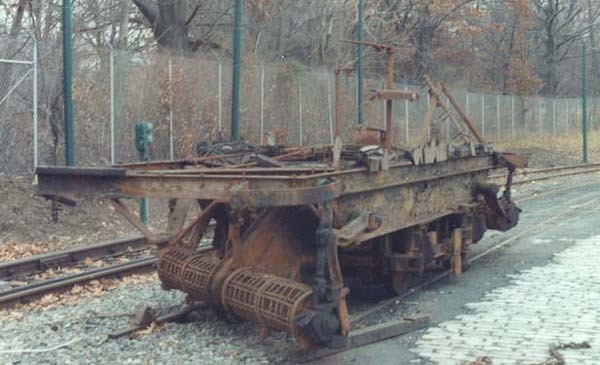 March 3, 2001: Moved from Ringoes, NJ to Phillipsburg, NJ - by North Jersey Electric Railway Historical Society. February 25, 2006: Power Trucks acquired for restoration of 2651. Public Service 2561 in Phillipsburg, NJ on September 10, 2011. The location is the "Pavonia Yard". Behind the camera (south) is Pavonia Avenue. Ahead, up the ramp, is the Newark Avenue station of the Elevated. The JACKSON car is stopped at the northbound station. Only the JACKSON line used this section of the elevated. The OAKLAND cars, which were rush hour only, used it for non-revenue movements to the Greenville Car House. It is evident that since the yard is empty (it could hold, maybe, a dozen cars) it must be rush hour. Why this single FEDERAL CAR IS STORED THERE IS A MYSTERY. It is way off course from its normal run, which was from Exchange Place, Jersey City to Kearny/Harrison. This location is farther north near the Union City/Hoboken border of Jersey City, known as "the Heights." Off to the right of the picture is the old Hudson County Court House. Central Avenue is ahead of the JACKSON car, which is headed for the DL&W Hoboken Terminal, about two miles in front of the car. The tracks, on which the FEDERAL car would run, were over 2 ½ miles to the south. The first day of the FEDERAL line was July 1, 1943 and the last day was July 31, 1945. WW II ended about two weeks later. Al Creamer does not give a date of these pictures but lists it as circa 1944. Al was taking pictures of FEDERAL cars on Montgomery Avenue on 9/16/1944. Also on 9/9/1945, three months after the end of the FEDERAL line, the NRHS ran a fan trip using a 3200 series car on the OAKLAND line but was signed FEDERAL. If the picture is 1944, it isn't a fan trip since the government wouldn't run one during the war. It must have been used on a regular run. Since the only other picture (in Al Mankoff's book Trolley Treasures) is signed FEDERAL, I am assuming it is a legit picture, not signed FEDERAL by a fan or mistake. By the way the picture in Mankoff's book is on Jackson Avenue, it must be either coming or going to Greenville carhouse on a non-revenue run. Public Service Car 2651 as it appeared in the summer of 1995. Public Service Car 2651 in its new home in Phillipsburg. Public Service Sweeper #5173 was burned out in a fire in the Newark City Subway. Its burned-out frame was acquired by NJERHS, brought to the surface, and transported to Phillipsburg, NJ for stabilization. Public Service Sweeper 5173 as seen in much better shape. This photo is believed to be in the Montclair Car Barn, now demolished. We are still attempting to clarify the photographer and date. PS 5173 as seen the morning it was brought to the surface and later that day headed to a new home in Phillipsburg, NJ. The date is fall of 1996. Photo by Bob Hooper. The drawing above shows a similar sweeper from the Public Service as drawn by Walter Olevsky for Model Railroad Craftsman© as it appeared in the August 1966 issue. Since this photo was taken in Phillipsburg, the frame has been cleaned up and a primer coat has been applied. These four cars, owned by the United Railroad Historical Society of NJ, are being restored by NJERHS. These two cars, owned by the United Railroad Historical Society of NJ, are being restored by NJERHS.